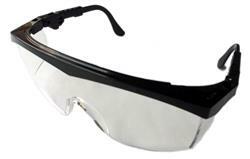 Adjustable clear safety glasses. These glasses protect your eyeballs from little bits of glass, which can attack when you least expect it. You needn't be grinding up a storm to be hit with minute airborne particles -- simply stacking glass or breaking out a score can result in tiny shards flying at you. These fully adjustable glasses are lightweight, comfortable and stylish, unlike those big old goggles that you might have purchased but never wear. One-piece polycarbonate lens with integral sideshields, they even filter out 99.9 percent of UV radiation, so you can use them for outdoor activities as well. The packaging will say either Studio Pro or Fuseworks, but they are exactly the same safety glasses regardless, made by the same mysterious overseas manufacturer. One size fits all. 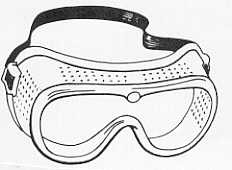 These plastic goggles are recommended apparel when cutting glass, grozing glass, or grinding glass on our Glass Grinders. They are also suitable for certain sports, such as water-skiing, sky diving, and horse-racing. This device is well named. When building any three-dimensional stained glass item, you will no doubt reach that moment when you will wish you had someone willing to hold your glass pieces while you solder them. This little device will do the trick. 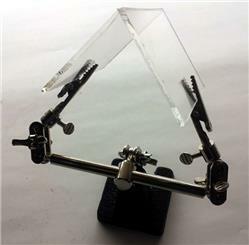 It can be used to hold one or two small pieces of glass in mid-air, or to hold a larger piece vertically while it rests on a table. Its double-ball joints allow adjustments to any angle. Many applications will suggest themselves to anyone with an active imagination. The base is very sturdy cast iron, but the arms and alligator clips are somewhat delicate and can't take a lot of rough maneuvering. 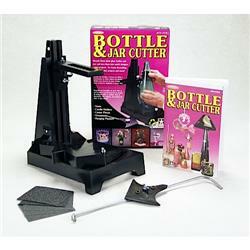 It's about 3.5" high, and 6" from elbow to elbow (or 10" with its alligator-clip arms outstretched). Recycle! Repurpose! Go green! Put old Uncle Elmer's empties to good use, even if you can't do the same to old Uncle Elmer himself. Provides basic organization for all of the commonly used tools and supplies for producing a stained glass project, arranged from left to right in the order they are used. These professional glass handlers' gloves from CRL have wrinkled finish latex coated palms that are ideal for handling all smooth surfaces, even wet glass. 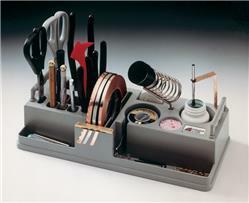 Sturdy plastic tool box for your stained glass supplies. 12" x 6" x 4". Professional grade light box. Excellent for tracing patterns, drawing patterns on glass and comparing glass color samples. Made with a white enamel metal shell, durable plexi-view screen and optional color corrected lights that show you the true colors of glass (unlike standard fluorescent tubes). The tool saves time by allowing you to cut patterns right on top of the box. Large 16" x 24" x 3/16" Plexiglas surface. Includes 1 year manufacturer warranty (excluding bulbs).